On July 1, 1902, the Lakewood Police Department began operation, as it was created by township ordinance. There were two members appointed at the inception of the Department. They were Charles Crane, Chief of Police, and Hartson S. Taylor, Police Officer. Officer Taylor was given a salary of one dollar and fifty-one cents per day. Chief Crane was compensated as a slightly higher rate of one dollar sixty-one cents per day. The original police ordinances provided a badge for each officer, but the individual officer was responsible for the cost of the rest of his respective uniform. The uniform as described in the ordinance was to be styled after the uniform worn by the members of the New York City Police Department. The first police arrest occurred on July 7, 1902 when George White was “collared” for being drunk and disorderly. The original police department was located on Ocean Avenue adjacent to the Central Jersey Railroad tracks, inside of the first permanent Municipal building. By the fall of 1902, the Lakewood Police Department consisted of five officers. Richard Beebe, who became the second Chief of Police on March 20, 1903, was later reduced in rank and in an ironic twist of fate, was struck by a hit and run driver at the intersection of Holly Street and Ocean Avenue while walking to work on November 3, 1922, and died several days later. An extensive investigation which included the examination of over two hundred suspect vehicles, failed to identify the driver or vehicle. The township committee offered a five-hundred-dollar reward. Officer Beebe was sixty- eight years of age and still working at the time of the event. Officer J.C. Soden became the first Sergeant in department history on or about June 16, 1924. A police switchboard in headquarters, and police call boxes located at various locations in town were installed and operational on or about September 1, 1924. Prior to that time, police officers relied on phones located in governmental buildings such as fire stations, public pay phones, or kind citizens who allowed the use of their personal phones to report criminal activity. 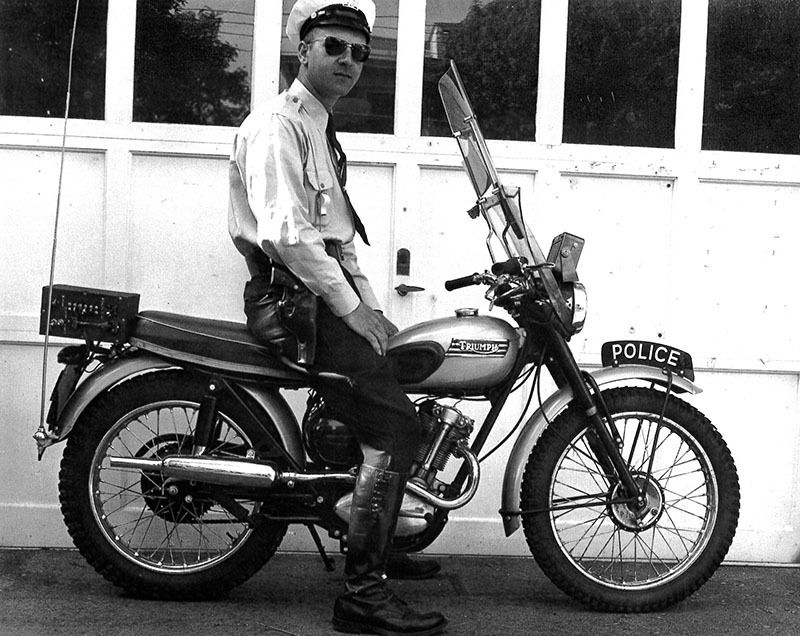 It should be also noted that in the early years of the department, when there were limited police vehicles, officers would routinely “Commandeer” the personal vehicles of the citizenry. Charles Norcross was the third Chief of Police replacing Beebe and served in that position from June 16, 1906 until his death in 1924, and was replaced by Walter Curtis, who became the fourth Chief of Police. During the years 1906 to 1925 the department employed from six to nine officers average per year depending on economics constraints. On more than several occasions, officers elected to leave the force, due to low pay. 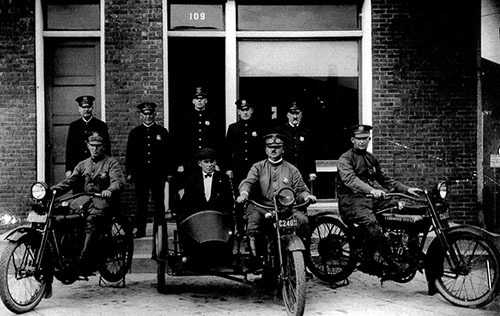 In 1920 the department purchased its first police motorcycle. In 1923 a Ford was purchased and became the first police car used by the department. While Chief Curtis was in charge, the nineteenth amendment of the United States Constitution, Prohibition, the Volstead Act, was being enforced, which required the police to raid many illegal alcohol stills, which resulted in the seizures of illegal whiskey and beer. Many illegal gambling concerns were also raided which netted the seizure of illegal slot machines and other gambling devices. Many of the estimated one hundred-fifty hotels in the township offered illegal gambling in one form or another, keeping the department busy in that regard. On February 16, 1925, John Nash was appointed to the force and became the first police officer of African-American lineage to hold that position, and served in that position for twenty years. In 1937, the department applied for a radio license with the Federal Communications Commission. A two-way radio system leased from Radio Engineering Laboratories of Long Island City, NY consisting of a fifty-watt base station and a fifteen-watt mobile radio installed in one patrol vehicle. A one hundred six- foot pole housed the aerial to aid in the efficiency of the system. The Lakewood Police radio system was assigned the call letters WRBT and boasted a range of ten miles. Officer Elmer Theibault traveled to New York City and attained a ninety-six per cent in a test administered by the FCC. For his efforts Officer Theibault was awarded a second-class radio telephone operators license, and was put in charge of the system. The other officers in the department received third class licenses which enabled them to operate either of the two radios. Department records at that time also indicate that members of the force who had been working nine hours a day had their shift reduced to eight hours. On April 10, 1947, Officer Hartley Richter, while on duty, was killed in an automobile accident while pursuing an offender. On September 1, 1947, the position of Captain was created, and Harry Justus Sr. was promoted to that rank. On December 19, 1949, the position of Lieutenant was created and Walter Comstock was promoted to that rank. On September 1, 1950, Russell Groff became the fifth Lakewood Police Chief as he replaced Chief Curtis who retired. Chief Groff then retired on February 6, 1951. Walter Comstock was appointed Acting Chief to replace Russell Groff, and became the sixth Chief of Police on January 1, 1952. During the next few years the police department grew to a force of over twenty men. In 1950, the Detective Bureau was permanently formed, and on May 22 of 1955, Raymond Reynolds and Stephen Belitrand were promoted to Detectives. On October 27, 1959, William C. Poole became the seventh Chief of Police, replacing the retiring Walter Comstock. 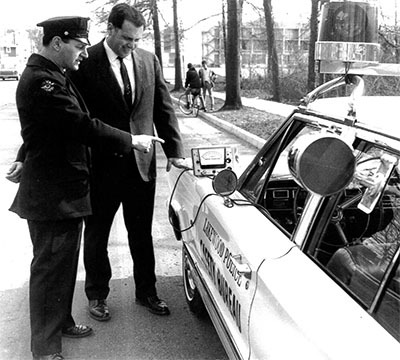 During 1965, a permanent Traffic Safety Bureau was created, and Officer Bernard Gindoff became the first Officer to serve in that unit. A specially equipped police vehicle was purchased and used for that purpose. A radar unit was installed in that vehicle, and speed enforcement commenced. The next few decades saw the diversified special training of department members in many different fields of police work. As a results of the changing times, several specialized units were created. They included the Police Dive Team, the Special Weapons and Tactics Unit(SWAT) and a Drug Investigation Unit in several different forms over the years. 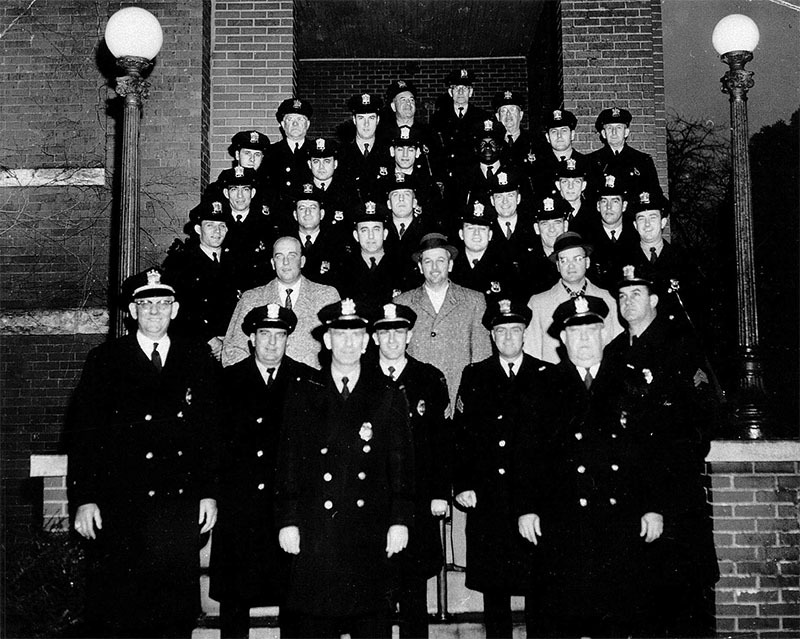 This afforded members of the force a chance for varied work assignments in a police department which swelled in ranks to over eighty men by 1984, when fourteen police officers were added to the force in March of that year, which represented the largest group of new hires in the history of the department. On October 01, 1979, Stephan Belitrand became the eighth Chief of Police replacing the retiring William C. Poole. On June 1, 1987, Michael Prisco became the ninth Chief of Police replacing Chief Belitrand who had reached the mandatory retirement age of sixty-five. During Chief Prisco’s tenure, the department upgraded to Computer Aided Dispatch(CAD) by the fall of 1991 into early 1992. Until that time, the police department had originally used large cumbersome log books in which short entries were recorded of police calls for service. Then, IBM cards were used for calls of service until the CAD system was fully operational. On February 01, 1994, Michael Lynch who had been serving as Deputy Chief of Police with John Marshall Sr. became the tenth Chief of Police in department history. When Chief Lynch retired, political changes within the township determined that a Civilian Police Director should oversee the department, the township committee hired three successive Civilian Police Directors. They were Mark Dorsey, Wayne C. Yhost, and Alfred Peters. On December 22, 2006, Robert Lawson was promoted to Chief of Police and became the eleventh Chief of Police in department history. Chief Lawson, an expert shot, maintained the premier training in the use of firearms and many other police patrol and investigative areas of study for members of the force, thus holding the Lakewood Police Department to the highest standards. On May 14, 2007, Officer William Preslar was killed in an automobile accident on Lakewood New Egypt Road while responding to a call for police service. 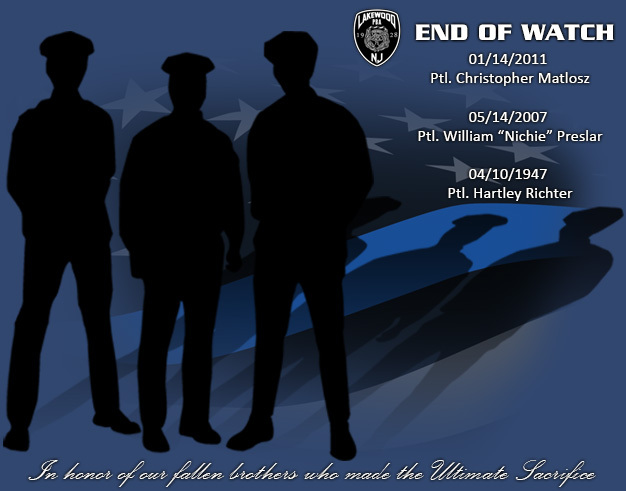 On January 14, 2011, Officer Christopher Matlosz was shot and killed in a confrontation with an armed individual near Joe Parker Road. A large contingency of local, county, state, and federal law enforcement officers working together, brought the perpetrator to justice in less than forty-eight hours. On August 1, 2016, Gregory H. Meyer became the twelfth Chief of Police, replacing Chief Lawson who had reached the mandatory retirement age of sixty-five. Chief Meyer takes over a police department which now boasts a force comprised of one hundred thirty sworn police officers and thirty-four civilians. 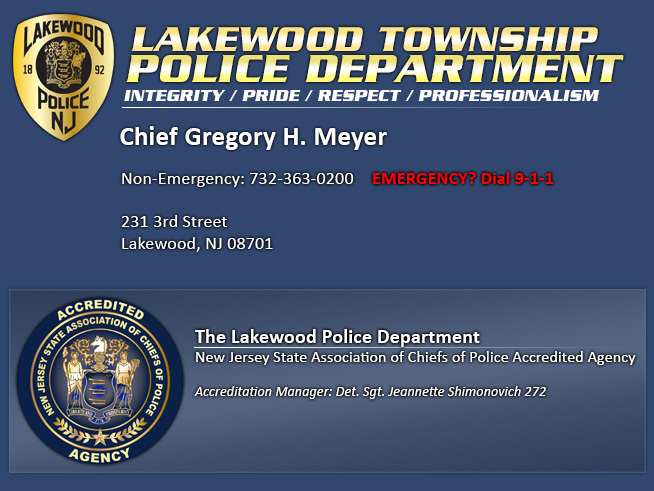 Continued training, and adherence to operating procedures and standards, allow Lakewood Police Department to remain one of the premier police departments in the State of New Jersey.